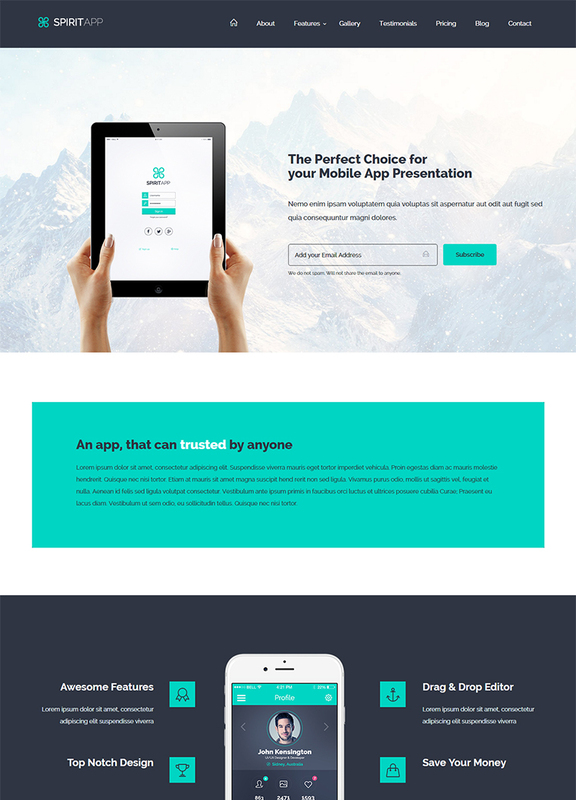 A multipurpose app landing page and UI kit template, SpiritApp is the perfect option to promote your app for download. This app can be used for any kind of business such as corporate, mobile app presentation, magazine, freelancers, designer, photographer and many others. Packed with 14 landing pages, 20 specialty pages, 1500+ UI elements, 500+ design blocks and 36 blog pages, this SpiritApp gives you an array of options to choose the best one as per your requirements. With the help of CSS media queries and fluid grid lay out, we are able to offer the users 100% responsive template. No matter if users prefer to open this SpiritApp on desktop or any small screen, its responsive approach that allows browsing with cross-platform compatibility. Aiming to provide the users with the option to make their website unique, this SpiritApp landing page and UI Kit comes fully equipped with Google web fonts. This allows the users to give their website a complete new look & feel and fulfill their other business needs. 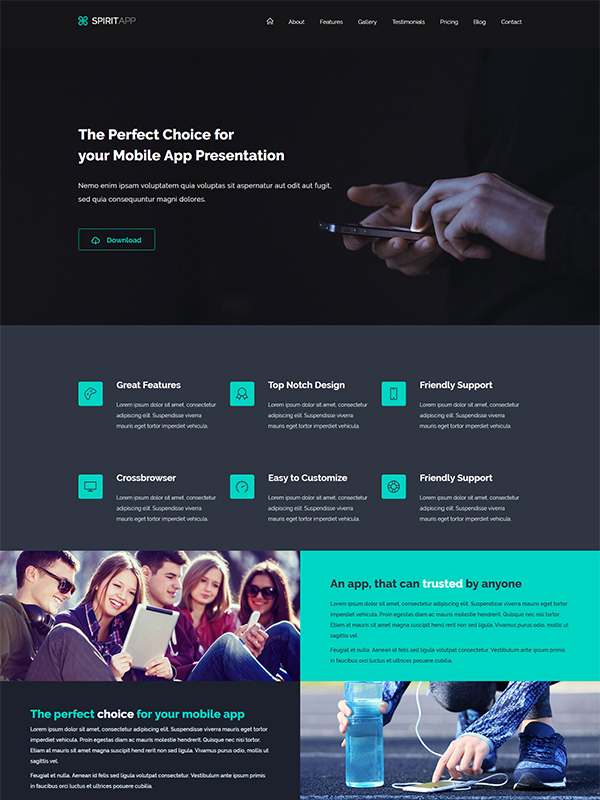 SpiritApp landing page and UI Kit is built using BootStrap 3x that makes it easier in making the landing page template fully responsive and optimized. As a result, the website opens beautifully on all sorts of devices irrespective of their size without giving any blurred effect. This template is designed in such a way that it is retina ready. Equipped with an ultra-clear display and extra-sharp fonts, this template looks delightful when viewed on high definition retina displays. This SpiritApp provides visual treat when opened on any new generation device. In order to avoid any kind of errors or bugs in the template that makes the design unstable and less appealing, all the HTML and CSS code written by our developers are 100% validated by W3C. This ensures that the template made is of superior quality and can be navigated smoothly. SpiritApp Landing page and UI Kit is equipped with font awesome that gives ultimate freedom to the users to select from a wide range of fonts in order to enhance the overall appearance of the website. With the usage of these fonts, you can impress the users with style. A set of multi-purpose templates, SpiritApp can widely be utilized by businesses of all sectors. Packed with astonishing features such as Bootstrap 3x powered, various UI kits and many more, this template is sure to meet all your needs and demands. The best part of this template is that it is compatible with several browsers such as IE10, Safari, Opera, Chrome, IE11 and Firefox. Packed with unique homepage layouts, this SpiritApp Landing Page and UI Kit can be utilized for the website to make them stand out of the crowd. The users get a multiple option of layouts to select from. SpiritApp helps you in making your website unique and distinct from others with the help of multiple color & font variations. The template is packed with an array of font and color options that can be utilized to give a stunning look. In order to keep the web pages lighter, our developers have used validated code and top quality images. As a result, it assures A+ grade pagespeed of the website and provide the perfect UX. Understanding the importance of blogs from marketing and SEO point of view, we offer this template packed with an array of pages. Equipped with all important features, these blog pages are sure to minimize your efforts. Another important feature added to this template is Google map API. With the help of this feature, you can easily map your establishments on the map so that it becomes easier for your clients to locate theme easily. SpiritApp Landing Page and UI Kit is fully equipped with fixed, sticky & intelligent sticky navigation. This provide the users with a wide range of list of navigation options to select from.